If you’re eager to learn more about the history of Karen people and their culture, visit our section dedicated to educating others about refugees from Burma. Get in touch with our staff or call the main office. ကညီကရၢမံၣ်နံၣ်စိထၣ်ဝဲၤဒၢး မ့ၢ်ဝဲကညီတၢ်ကရၢကရိအဆိကတၢၢ်တခါလၢ အအိၣ်သူၣ်လီၤအသးလၢ ကီၢ်အမဲရကၤအပူၤ, လၢဘၣ်တၢ်ဒုးအိၣ်ထီၣ်အီၤလၢ ကညီပှၤဘၣ်ကီဘၣ်ခဲလၢ အိၣ်ဟဲလၢကီၢ်ပယီၤအပူၤတဖၣ်န့ၣ်လီၤ. ပမၤစၢၤပှၤဘၣ်ကီဘၣ်ခဲလၢ အတၢ်ဟဲသူၣ်လီၤဆီလီၤအသးလၢ ထံကီၢ်အသီအပူၤဒီး ဒ်သိးအတၢ်တိာ်တၢ်မုၢ်လၢ်ကလၢထီၣ်ပှၤထီၣ်အဂီၢ် လၢတၢ်မၤစၢအကျိၤ အကွာ်အါမံၤအါကလုာ်န့ၣ်လီၤ. ပအိၣ်စ့ၢ်ကီးဒီး တၢ်မၤစၢၤသ့ၣ်တဖၣ်လၢ တၢ်ကရၢကရိအဂုၤအဂၤသ့ၣ်တဖၣ်အဂီၢ် ဒ်သိးဒီး အဝဲသ့ၣ်တဖၣ်ကမၤလိန့ၢ်တၢ်ဘၣ်ဃး တၢ်ကသ့မၤသကိးတၢ်ဒီးပှၤတဝၢလၢအနီၣ်ဂံၢ်အါထီၣ်ကွ့ၢ်ကွ့ၢ်တဖုအံၤအဂီၢ်န့ၣ်လီၤ. ကညီတဝၢမံၣ်နံၣ်စိထၣ် အတၢ်တိာ်ကျဲၤမ့ၢ်ဝဲတၢ်ဒုးဒိၣ်ထီၣ်ထီထီၣ်ဒီး တၢ်မၤဂ့ၤထီၣ်ပှၤဘၣ်ကီဘၣ်ခဲလၢအဟဲလၢ ကီၢ်ပယီၤဒီးအိၣ်ဆိးလၢမံၣ်နံၣ်စိထၣ်ကီၢ်စဲၣ်တဖၣ် ဒ်သိးအတၢ်အိၣ်မူအပတီၢ်ကထီထီၣ်ဝဲအဂီၢ်န့ၣ်လီၤ. ပှၤကညီဖိလၢမံၣ်နံၣ်စိထၣ်အပူၤအိၣ်ဝဲအါန့ၢ်ဒံးပှၤအဂၤ ၁၂,၀၀၀ ဒီးမ့ၢ်ဝဲပှၤကညီဖိတဝၢနီၣ်ဂံၢ်အအါကတၢၢ်လၢ ကီၢ်အမဲရကၤအပူၤန့ၣ်လီၤ. မံၣ်နံၣ်စိထၣ်မ့ၢ်စ့ၢ်ကီးလီၢ်အိၣ်ကဒုလၢကလုာ်ဒူၣ်အဂၤတဖၣ်လၢ ဟဲလၢကီၢ်ပယီၤပှၤဘၣ်ကီဘၣ်ခဲ လၢအနီၣ်ဂံၢ်အါန့ၢ် ပှၤအဂၤ ၁,၀၀၀ အဂီၢ်စ့ၢ်ကီးန့ၣ်လီၤ. ပှၤဘၣ်ကီဘၣ်ခဲလၢ အိၣ်ဟဲလၢကီၢ်ပယီၤဒီး သုးလီၢ်သုးကျဲဆူ မံၣ်နံၣ်စိထၣ် ခီဖျိတၢ်ဂ့ၢ်လၢအလီၤပလိၣ်လိာ်အသးဒ်ပှၤဂုၤပှၤဂၤအသိးန့ၣ်လီၤ. အဝဲသ့ၣ်ဟဲဒ်သိးကဃုန့ၢ်တၢ်ဖံးတၢ်မၤလၢအဂ့ၤ, ကဒိးန့ၣ်ဘၣ်တၢ်ကူာ်ဘၣ်ကူာ်သ့လၢအပတီၢ်ထီ, ဒီးဒ်သိးကအိၣ်စဲဘူးဘၣ်ထွဲဒီးပှၤတဝၢလၢ အဂၢၢ်ကျၢၤတဖုအဂီၢ်န့ၣ်လီၤ. • တၢ်ရဲၣ်တၢ်ကျဲၤတဖၣ်ဘၣ်တၢ်ဒုးအိၣ်ထီၣ်အီၤခီဖျိပှၤတဝၢ ဒီးတၢ်ဒုးအိၣ်ထီၣ်အီၤလၢပှၤတဝၢအဂီၢ်- ကညီကရၢမံၣ်နံၣ်စိထၣ်အံၤ ဘၣ်တၢ်ဒုးအိၣ်ထီၣ်အီၤဒီးဘၣ်တၢ်ပၢဆှၢရဲၣ် ကျဲၤအီၤလၢပှၤဘၣ်ကီဘၣ်ခဲ သ့ၣ်တဖၣ် လၢဟဲလၢကီၢ်ပယီၤလၢအနၢ်ပၢၢ်ပှၤတဝၢလၢပမၤစၢၤသ့ၣ်တဖၣ်အတၢ်လိၣ်ဘၣ်ဒီး အတၢ်မုၢ်လၢ် ကွၢ်စိန့ၣ်လီၤ. • တၢ်ဟ့ၣ်နီၤလီၤတၢ်ဆီၣ်ထွဲမၤစၢၤလၢတၢ်သူၣ်တုၤလီၤသးတုၤလီၤ- ပပှၤမၤတၢ်ဖိသ့ၣ်တဖၣ်ဟံးန့ၢ်တၢ်ဆၢကတီၢ်ဒ်သိး ကနၢ်ပၢၢ်ပှၤတဂၤစုာ်စုာ်အတၢ်အိၣ်သး ဒီးမၤလီတံၢ်ဒ်သိး ပှၤသ့ၣ်တဖၣ်အံၤ ကဒိးန့ၢ်ဘၣ်တၢ်မၤစၢၤကိးမံၤ လၢအဝဲသ့ၣ်တဖၣ်လိၣ်ဘၣ်ဝဲအဂီၢ်န့ၣ်လီၤ. • အိၣ်ဒီးတၢ်ကရၢကရိလၢအမၤသကိးတၢ်တဖၣ်လၢအဂၢၢ်အကျၢၤ – ကညီကရၢမံၣ်နံၣ်စိထၣ်အံၤ ပာ်လုၢ်ပာ်ပှ့ၤတၢ်မၤသကိးတၢ်ဒီးတၢ်ကရၢကရိအဂုၤအဂၤတဖၣ်ဒ်သိးကမၤစၢၤပှၤဘၣ်ကီဘၣ်ခဲသ့ၣ်တဖၣ် လၢကဒိးန့ၢ်တၢ်မၤစၢၤဆီၣ်ထွဲအကျိၤအကွာ်အါမံၤဒီးမၤစၢၤစ့ၢ်ကီးတၢ်ကရၢကရိသ့ၣ်တဖၣ်ဒ်သိးက မၤလိန့ၢ်အါထီၣ်ဘၣ်ဃးတၢ်သ့မၤသကိးတၢ်ဒီးပှၤတဝၢလၢအအါထီၣ်ဂီၢ်ထီၣ်တဖုအံၤအဂီၢ်န့ၣ်လီၤ. The Karen Organization of Minnesota is the first social services agency in the country founded by Karen refugees from Burma. We offer a variety of programs to help refugees transition to life in a new country and achieve their goals. We also provide resources to help organizations learn how to work with this growing community. The mission of the Karen Organization of Minnesota is to enhance the quality of life for all refugees from Burma in Minnesota. 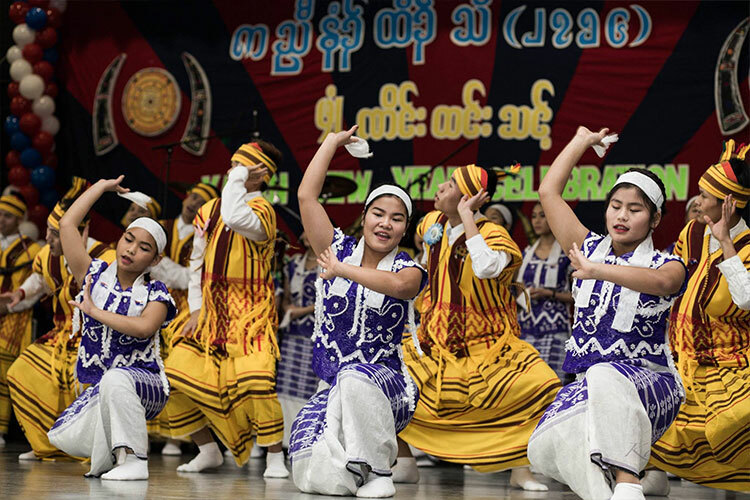 More than 17,000 Karen people live in Minnesota, making it the largest Karen community in the country. Minnesota is also home to more than 2,000 refugees from other ethnic groups in Burma, including Karenni and Mon. Refugees from Burma come to Minnesota for the same reasons many people do: to find good jobs, access high-quality education, and connect with a strong community. Learn more about Karen people and other ethnic groups from Burma. Programs designed by and for the community: KOM is founded and led by refugees from Burma who understand the needs and goals of the community we serve. Providing wraparound support: Our staff take time to understand each person’s situation and make sure they can access all of the resources they need. Strong partnerships: KOM values working with partners to help refugees access more opportunities and to help other service providers learn how to work with this growing community. Your support helps create opportunities for refugees. The Karen Organization of Minnesota's mission is to enhance the quality of life for Karen and other refugees from Burma in Minnesota. Karen Organization of Minnesota, Copyright 2017 All Rights Reserved.